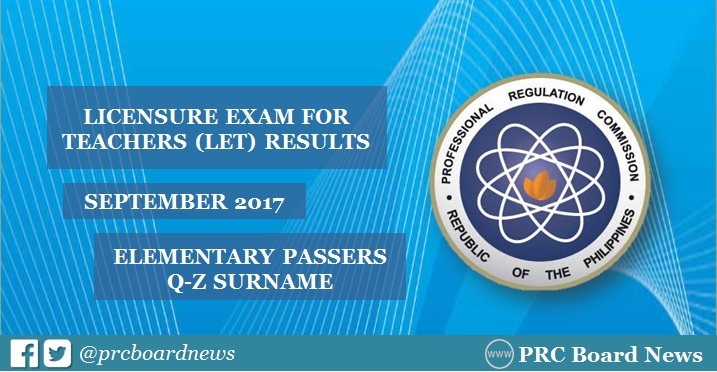 MANILA, Philippines — The long wait for the official LET result has ended as the Professional Regulation Commission (PRC) released on Monday, November 27, 2017, the full list of passers for Elementary Level. PRC announced that 21,198 elementary teachers out of 80,509 examinees (26.33%) successfully passed the LET. It is further announced that of the 21,198 elementary teacher passers, 19,581 are first timers and 1,617 are repeaters. In order to pass the September 2017 LET, an examinee must obtain an average rating of not less than 75% and must have no rating lower than 50% in any of the tests. The examination was conducted in at least 27 testing centers nationwide and two (2) centers abroad for the special licensure exam. Per PRC Resolution No. 2016-1019, LET result is target for release this Monday, November 27. Recent updates from reliable sources confirmed that results may be released this week despite the too many cancellations of government work in the past weeks due to transport strike and the country's hosting of ASEAN Summit. In the same period last year (September 2016), results were announced online in 48 working days after the exam. A total of 23,378 elementary teachers out of 77,466 examinees (30.18%) and 31,334 secondary teachers out of 92,754 examinees (33.78%) successfully passed the exams.